The Finger Lakes Gift & Lounge (aka The Flounge) is one of downtown Geneva’s newest businesses and is firmly rooted in the local and the region, offering a wide selection of handcrafted items from regional artisans, locally-made juices, regionally-roasted coffee, and regional craft beers and wines. This is one of those times when you can amplify the local imapct of your purchasing power by shopping in a local store that buys directly from local artists and businesses. So come on down to the Flounge on Saturday, Nov. 3rd, and spread some Geneva Love! We had a wonderful array of submissions for the t-shirt contest, but there was only one that almost all the judges agreed upon: a modified version of the current “Love Geneva” logo with a big red heart and the tag line “It’ll Love You Back!” These shirts (and tote bags) are currently in production and should be available in a few short weeks! 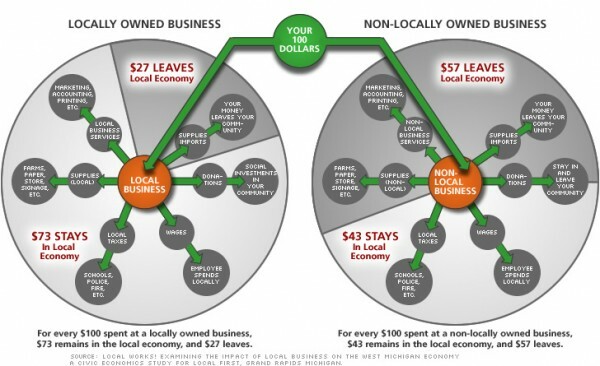 This information is there on the left under the “Buying Local” link, but we thought it might be useful to re-post some info here on the main page. Create more good jobs: Small local businesses are the largest employer nationally, providing the most jobs to residents. Get better service: Local businesses often hire people with a better understanding of the products they are selling and take more time to get to know customers. Just contrast shopping at Churchs Hardware to shopping at Lowes! Put your taxes to good use: Local businesses in town centers require comparatively little infrastructure investment and make more efficient use of public services as compared to nationally owned stores entering the community. You can see this is true in Geneva just by looking around. We’ve chalked up yet another successful cash mob! Mother Earth Natural Foods expresses their gratitude to all who participated. As they write, “We did indeed benefit from increased business and new customers visiting us and seeing what Mother Earth was all about. It was a great experience over all!!! !” (this, despite one of their freezers malfunctioning!). So thanks to all who turned out to spread the love! The cash mob seems to be sustaining its strength quite well, so we’ve got another one scheduled for Saturday, November 3rd. The site will be announced soon!! Also, thanks to all who participated in the t-shirt competition. The judges have made their decision and we’ll be unveiling the t-shirts and tote bags in a few weeks. We’ll post the winning image soon! We’ve had great success with the CASH MOBS, so let keep it up! The last site, Whisper Chocolate, was a newcomer to Geneva, so let’s go with an establishment that has been here for over 33 years: MOTHER EARTH! Mother Earth opened in Geneva in 1979 and provides the community with quality natural foods (including local milk and yogurt), vitamins and minerals, eco-friendly products, and a huge array of bulk items. So come on down and pick up a few items or a grocery cart’s worth of stuff! Meet other Love Genevans! If a hundred people show up during the cash mob and spend $5 each, that will bring in $500 in just two hours! Believe us, the staff at Mother Earth will be extremely grateful for your patronage and support. Help spread the word — and we’ll see you there! T-Shirt competition: deadline fast approaching! Feel free to include one of the taglines we use — “Shop Local” or “Support Local Independent Businesses” or “It’ll Love You Back” — or come up with one of your own; or don’t use a tagline at all. Be creative! Winners will receive two free t-shirts, plus pride in seeing their design all over town. Yesterday’s CASH MOB at Whisper Chocolate was “a huge success” according to co-owner Jasmine Mead. The crowds came in all day and they lost count at some point. But Jasmine reports that it “was one of the best sales days we’ve had!” So a hearty, chocolate-dipped THANK YOU to all who came out. We seem to be doing great with holding a CASH MOB every two weeks, so we’ve scheduled the next one for Saturday, October 20th from 11am-1pm. We’ll announce the location soon. Until then, don’t forget the T-SHIRT DESIGN COMPETITION. The deadline in Oct. 15th.